Having a Lush Bath is one of my favourite things to do to have a bit of a relax. Especially with all the new Oxford Street goodies that have now hit the stores now and dare I say it, this is actually the first time I've gotten round to using these since my London Trip! So a really good Lush Pamper is on the cards! I love the fact that Lush Baths don't have to be a really long soak and full pamper routine, although that is preferred! But you can have such a great relax, so easily with them, even when youre trying to cram it into your busy schedule! 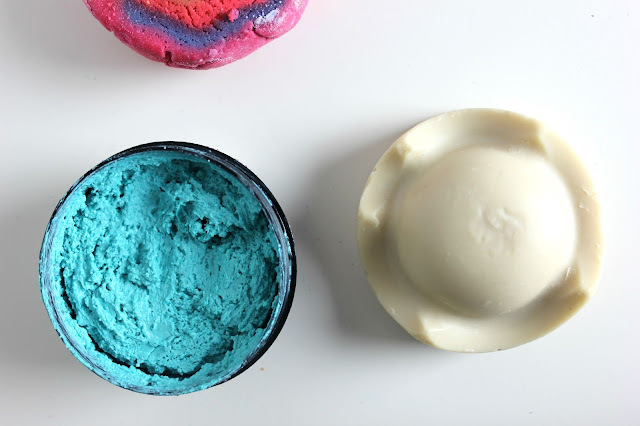 Two new products that I have been loving together have been Intergalactic Bath Ballistic and Granny Takes A Dip Bubble Bar. Granny Takes a Dip as a Bath Ballistic, was always one of my all time favourites due to the ginger and pepper ingredients, which are lovely for aching muscles and the bubble bar is no different. It also includes lemon too, which is a great one to wake you up a bit! 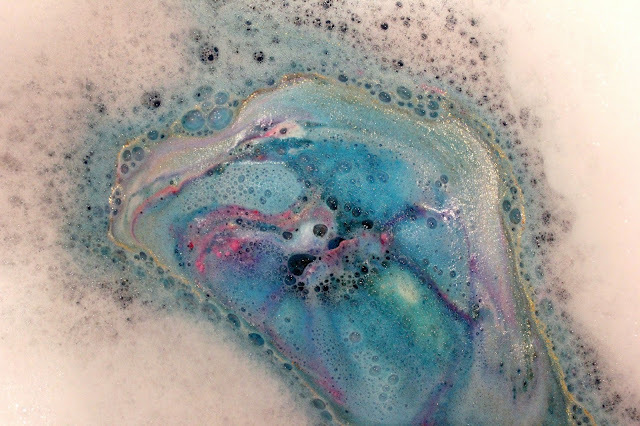 Intergalactic Bath Ballistic, is maybe one of the prettiest ones I have ever seen, the colours it creates as it fizzies away. 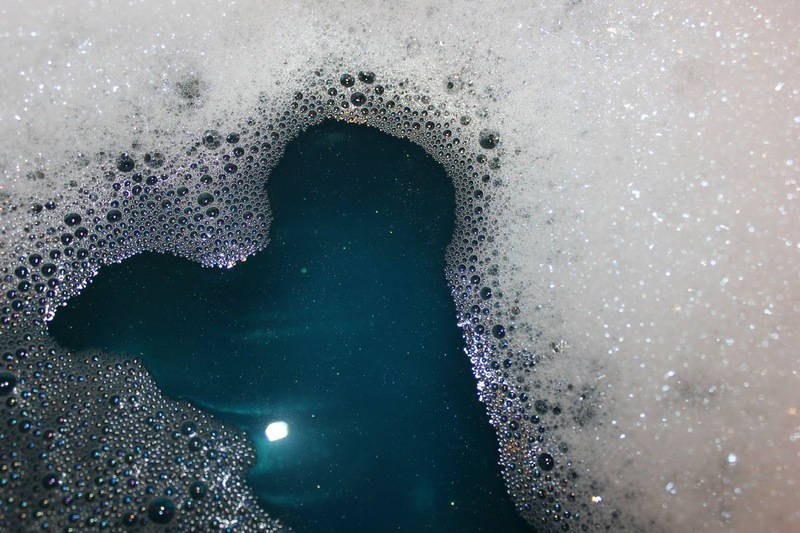 To the beautiful dark blue, that it turns your water into, that really is like looking at the night sky full of stars. The scent itself is invigoratingly minty, which if the lemon hasn't woken you up, this will! 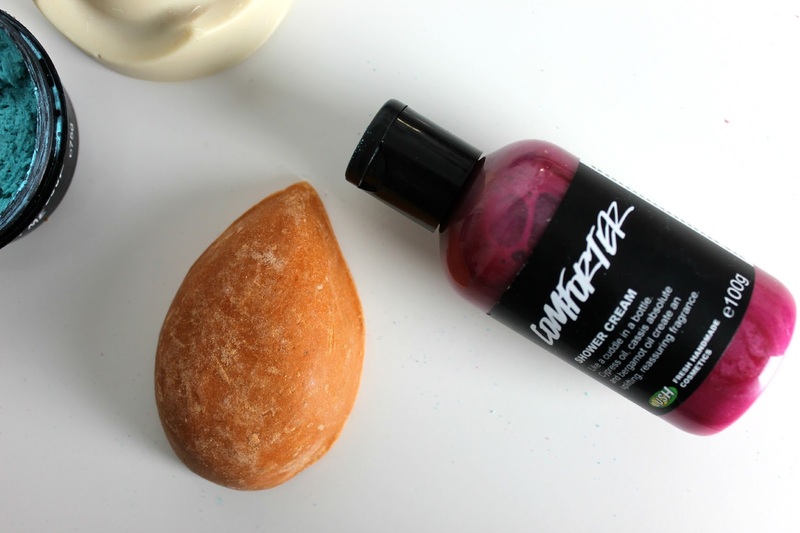 The ever so popular Comforter Bubble Bar has turned into a Comforter Shower Cream, which is fast becoming one of my all time favourite Shower Gel's from Lush. However as its more of a cream, its a lot more moisturising on the skin and I find the scent does last that bit longer too. The scent itself is blackberry based and just like its name, very comforting. I'll admit, my feet aren't something I tend to remember, I guess mainly because how many exciting foot products are their actually out there? So as soon as I spotted the Pumice Power Foot Soap, I thought thats a little different. Its such a simple and quick product to use too, with orange again for a bit of a refresh. It also creates quite a thick almost cream, so its not as harsh on the skin. A favourite body butter of mine is the King of Skin Body Butter, I think the idea behind a Solid Body Butter is just genius. I always find this quicker to use and I'm not sure if thats just a mental thing rather than it actually being any quicker, although it does save on packaging too! King of Skin is packed full of bananas, which I love so thats me already sold, but bananas are actually a great source of nourishment to the skin, along with other ingredients, this is a brilliant one for dehydrated skin. The Don't Look at Me Face Mask, is probably one of my all time favourite face masks just down to the look of it. Having a bright blue surf face is quite hilarious, but practicality wise it does so much for your skin. From exfoliating, to nourishing, softening and toning, its like the wonder mask, it does everything in the one go! I have to say, even after just having one, I think I fancy another pamper now haha! King of Skin is one my favourite Lush products. I've got one stashed away in a drawer in time for Autumn since my skin always dries out. The Don't Look At Me mask looks really cool, must resist temptation! Ooh, you've got some fab goodies. 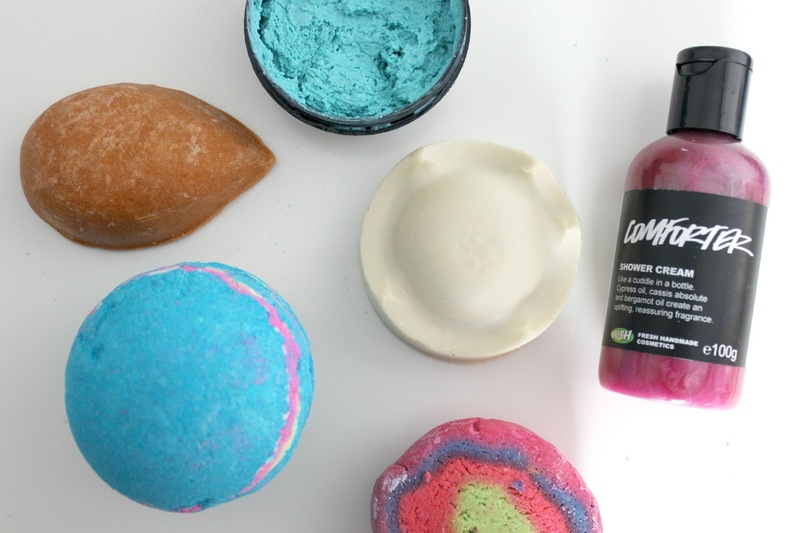 I really must try out the Comforter Shower Cream, I absolutely love the bubble bar, in fact, I think it's my favourite Lush product of all time! I need intergalactic in my life. I picked up a comforter shower crème the other week and I'm super excited to give it a go! Love lush products! They all smell so good! This foot scrub sounds great too! Nothing beats a good Lush pamper - I'm dying to head into the London Oxford Street store but unfortunately my next trip to London isn't until early next year!